Having a delightful collection of make up is all very well but only if we have something swanky to put it all in. If like many women you have had the same mascara stained make up bag since secondary school then it sounds like you need to invest. Let’s not forget how much wear and tear a make up bag sees. Eye-liner smudges, crumbling eye shadows, leaking lip glosses, surely our make up bags need to be just as sturdy as our handbags? 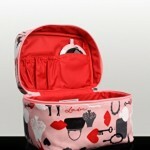 Lulu Guinness Icon Print Vanity Case is pricey at £50 but you are getting a lot of bag for your money. It is also pretty sturdy and will last you a lot longer than a £5 jobby from the chemists. It is also worth noting that it is completely beautiful, it is dusty pink with typical Lulu prints including dainty hearts and vintage keys and it comes with a mirror of the same design. 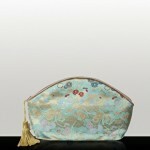 Holistic Silk Make Up Bag With Lavender £24 is the ultimate luxury. It not only has a waterproof faux leather metallic lining but it is also lavender scented with contrast tassel detail. It is the perfect size to pop in your handbag and will look far more glamorous peeping out of the corner than your scruffy old make up bag. Gently squeeze where you feel the lavender to rejuvenate the aromatic therapeutic fragrance. Juicy Couture Quilted Barrel Cosmetic Bag £41 has all over text embroidery of the much loved logo. This make up bag comes in two sizes and two colours. We like the smaller version in pink. If your going to splurge on a make up bag you might as well get it noticed!